QAEB. Quasi-analytic error-bounded, a technique for ray tracing. F.K. Musgrave gives to it a full chapter in [Ebert]. 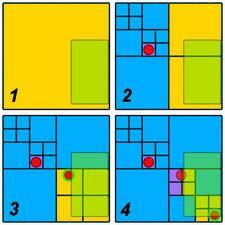 Quadtree. Explained on Kyle Schouviller website. Quadtree. Image representation as a tree. - [Bres] p. 331 sq. [Cocquerez], [Foley], [Processing]. - Quantization may be creative: (as a function of Cubase) "it is not only a method to fix event placement errors, but it can also become a true tool for creation, like the quantization pre-trimmings". (our translation from La quantification créative, Home-Studio Sept. 2012. - [Brinkmann], [Foley], [Gonzalez]. - Shortly : mapping any set of points upon a regular grid. This applies to images as well as to music.